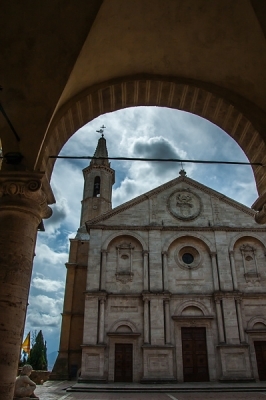 The Historic Centre of the City of Pienza is the earliest example of a Renaissance "ideal town". It was created by Pope Pius II, who decided to refurbish his poor hometown of Corsignano and turn it into his papal summer court. Bernardo Rossellino was the main architect who executed the pope's ideas. The buildings and objects that he designed are in a Gothic style with German influences. Also, the technique of sgraffito was used all over town. Cathedral: built by Rossellino between 1459 and 1462. Piccolomini Palace: home of the originally Siennese Piccolomini family, among which are the popes Pius II and Pius III, and the scholar & astronomer Alessandro Piccolomini. Town Hall with a crenellated tower (1462). The square also features an ornate well designed by Rossellino. Pienza is a small but nevertheless pretty little town in the Tuscan hills. It has preserved its medieval center very well, it all comes across as very homogenous. The center is almost completely traffic free, so it's a pleasure to walk in. An hour or 2 will be sufficient time to take in the main sights and roam around for a while. 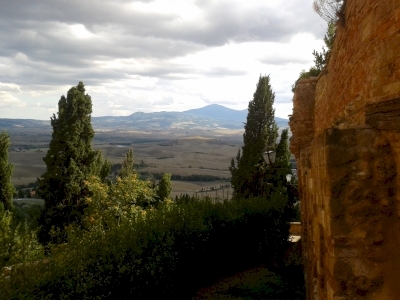 I almost immediately found out that the place to be in Pienza is the walkway overlooking the Orcia Valley. Local old ladies and Japanese tourists alike enjoyed the combination of the warm sun in their faces and a great view over the Tuscan countryside. I quickly purchased a pannino con prosciutto at a nearby cafe and joined them - already that great feeling of being in a different world, just 4,5 hours after I left Amsterdam. Dutifully I also had a look at the local sights. At the central square, quite small and strangely trapezoidal-shaped, I visited the interior of the Cathedral. And I joined a guided tour of the impressive Piccolomini Palace next door. It costs 7 EUR and is in Italian only, but worth going. Both Palace and Cathedral are virtually museums that hold major works of medieval art. Pienza is pretty. Pienza is very little. Pienza is WHS with OUV that is rather philosophical, I would say. Pienza is located on a hill, so, there are beautiful views on the Orcia valley (another WHS) and towards Monte Amiata (photo), which is also worth-visiting: The Monte Amiata mountain is covered by thick beech and chestnut forest, and the open-air thermal baths can be visited in Bagni San Filippo at the foot of the mountain, and... freshly proposed TWHS Via Francigena crossed Monte Amiata in Abbadia San Salvatore! 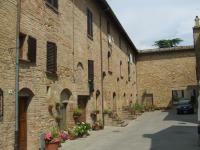 It is not necessary to say more about Pienza, all basic data is given already in other reviews. There is actually only one square (Piazza Pio II) and ca. 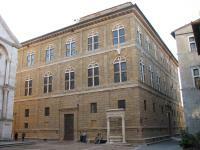 4 buildings (Cathedral, Palazzo Piccolomini, and several others palaces) that deserve attention. However, it is enough to make Pienza so special. Besides the architecture, food is also very delicate in Pienza. The historic center of the Pienza is inscribed on UNESCO List because it occupies a seminal position in the development of the concept of the planned “ideal town”, but you have to be a student of architectural history to fully appreciate that. For a relative dilettante, Pienza is simply a gorgeous postcard-size hill town, with no vehicular traffic on its narrow streets and dozens of picture-spot opportunities around every corner. Not too overrun by tourists either, probably on the account of being less famous than the likes of Siena or San Gimignano as well as sitting somewhat away from the beaten path. Its size means that an hour or so is enough to cover the entire historic part of Pienza on foot. Piazza Pio II and Corso Rosselino are where most of the major architectural landmarks are situated, and there are a number of quaint little walkways and a terrace with sweeping views over Val d'Orcia. The cathedral is certainly worth stepping in; a visit to Palazzo Piccolomini as well as exploration of artisan shops can stretch the time in town to about half a day. Since Val d'Orcia is a World Heritage site on its own merit, you should combine your visit to Pienza with a leisurely drive along SP146 towards San Quirico - or some other similar route - which offers many good viewpoints to appreciate the scenery for which the valley is renowned. I visited this WHS in August 2013. Without Pienza there wouldn't have been Florence as we know it! 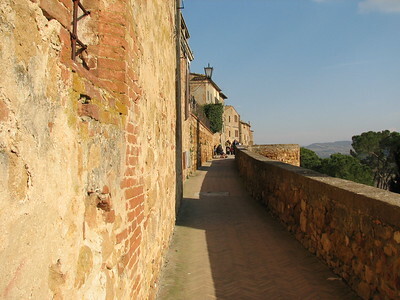 It is the first Renaissance town and was used as a model for other towns and cities in Tuscany and Italy. The views over Val d'Orcia are worth taking in at sunset with a glass of wine. Via delle Case Nuove is interesting too and there is a very good organic gelateria named Buon Gusto which is the best in town! The monumental buildings surrounding the Piazza Pius II were certainly impressive, the white masonry of the duomo contrasting with the brown stone of the Piccolomini and Amouidi Palaces. But I found the newly restored houses on via della Casa Nuove equally interesting. I reached Pienza by bus from Buonconvento station. I have been once in the beautiful town of Pienza, constructed on the top of a hill surmounting the Orcia Valley, also listed as a WHS, between the Mount Amiata and the region of the Crete Senesi. It is an ideal Renaissance town, in which was transformed from 1459 under the Pope Pius II (Enea Silvio Piccolomini), that was born here when it was a medieval village called Corsignano; the Renaissance centre was projected following the theories of Leon Battista Alberti by his collaborator Bernardo Rossellino. On the beautiful trapezoidal Pius II’s Square, that is situated on a rock, the boundary of the town, and has a herringbone paving edged with travertine, overlook the most important buildings. The cathedral, projected by Rossellino with the influence of Alberti and made of travertine, has a Renaissance tripartite façade, divided by pillars and columns and decorated by the coat of arms of the family Piccolomini. The interior, divided in three aisles by clustered pillars from which spring the arches and the cross-vaults, was inspired by the Late Gothic German churches, that the Pope saw in his journeys around Europe. Inside there is a nice baptismal font and altars by Rossellino, Giovanni di Paolo, Vecchietta and Matteo di Giovanni. The Piccolomini Palace, constructed on the site of old houses owned by the family and constructed by Rossellino on the base of the Alberti’s Rucellai Palace in Florence, has three same three-storeyed façades, resting on a travertine plinth and divided by pilasters in three bands of sandstone rusticated ashlar, interrupted by arched double windows, and a fourth one with a triple-tiered lodge overlooking on a raised garden. The court is decorated with graffito on the second and third floors and in front of the palace is the most beautiful well of Pienza (there are also many fountains), projected by Rossellino. The Episcopal Palace (the former Pretorio Palace) was purchased by the Pope for the Cardinal Rodrigo Borgia, who transformed it by addicting a storey and replacing the Gothic windows. The town hall, made of stuccoed tufa and brick with graffito, is in Tuscan style with an open lodge made of travertine at the ground level and a crenellated tower. The other major buildings, built for cardinals and other members of the papal court (even if some anterior buildings survive), are situated on the Rossellino Avenue, bringing from the Gate al Prato to the Gate al Ciglio, the entrances of the walls. There are the Gothic Church of St. Francis, the Atrebatense Palace, a Gothic building with Renaissance decorations, the Ammanati Palace, built in Renaissance style by Gerolamo Ammanati from Pavia, a favourite of the Pope, the Renaissance Gonzaga Palace, with a garden, the Treasurer’s Palace, the Palazzetto, made of bricks, the Palace Jouffroy, the Canonical Palace, the Palace Tommaso Piccolomini, the Palace Simone Piccolomini, the Palace Lolli and the convent of St. Charles. In the Street of the New Houses are the houses built by the Pope for the people and the quarter Gozzante contains the oldest houses of the town. I liked very much this town because of the beauty and quality of its architecture. It’s worth to be visited if you are in Tuscany (if you go there you must leave the car out of the centre) and justifies the inscription also because it is the first Renaissance town, even if it could be inscribed in one single site with the Orcia Valley (another separated WHS), of which is part. 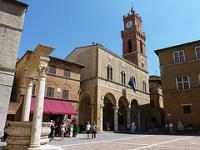 A lovely little town situated on the quinessentially Tuscan drive between Montalcino and Montepulciano. What the town lacks in notoriety in comparison to its famous neighbours, it makes up for in beauty and grace. Almost completely redesigned between 1459 and 1462 and renamed on the orders of hometown son Pope Pius II, the main square is the picture of Renaissance architecture, while the surrounding houses retain old village charm. A highly recommended lunch stop for those doing a tour of the vineyards of Southern Tuscany. Astronomy and Astrology: Piccolomini Palace: Allesandro Piccolomini was a 16th century scholar and astronomer, who wrote The treatises Sfera del mondo e Delle stelle fisse (The sphere of the world and The fixed stars) (1540), in which he adhered to Ptolemaic theories.